You collected together and changed their lives for the better. These four venerable fathers lived in the mountains near Cyrus in Syria as open-air ascetics in the fifth century. 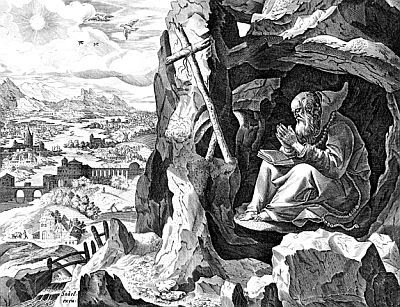 John was a friend and disciple of Saint Limnaios (Feb. 22), and from him was inspired to imitate his example of living at the edge of a mountain in the open air, wearing a goatskin, loaded with heavy chains, and living on nothing but bread and salt. Moses, Antiochus and Antoninus also embraced this same type of life. All these men were still alive when Bishop Theodoret wrote the account of their lifestyle and example below. Ch. 22, 7. Limnaios gathered together many who were deprived of their sight and had been compelled to beg. Building dwellings on both sides, east and west, he invited them to live there and sing hymns to God, telling those who visited him to supply the food they needed. He himself, immured in the middle, exhorts both groups to hymnody. It is possible to hear them hymning the Master continually; and he continues to show such humanity towards his fellow-men. The length of time of open-air contests has been the same both in his case and in that of the great James: they have already completed their thirty-eighth year. Ch. 23, 1. John too has keenly embraced this mode of life, a man conspicuous, in addition to other virtues, for gentleness and kindness. Repairing to a jagged ridge, prone to storms and northward-facing, he has now spent twenty-five years there, exposed to the contrasting assaults of the atmosphere. All the other things - not to proceed through them individually -, food and clothing and loads of iron, are much the same as with the ascetics [Limnaios and Thallasios] described above. He is so raised above all human things that he reaps no comfort from them. Clear proof of this I shall provide at once. When some well-meaning person planted an almond-tree right by his bed, which then with time became a tree, providing him with shade and feasting his eyes, he ordered it to be cut down, to stop him enjoying any relief therefrom. 2. This life has also been embraced by Moses, who contends on a high hill-top surmounting the village of Rama, by Antiochus, an elderly man who has built an enclosure on a quite uninhabited mountain, and by Antoninus, who in an aged body contends just as youths do. They have the same dress, food, standing posture, prayer, labors all night and all day; neither length of time nor old age nor physical weakness overcome their endurance, but they preserve in themselves love of labor in full bloom. God, the Umpire of virtue, has very many other contestants in our mountains and plains; it would not be easy merely to number them, let alone record the life of each one. So having offered sufficient benefit from them for those who wish to profit, I shall turn to a different class of narration, while asking to receive the blessing of these men as well.